A look at the challenges climate change presents for food choices and everyday life. A dining experience, an omni-channel platform, and a new approach to sustainable transitions for civilians. Partners: The International Research Institute for Climate and Society at Columbia University and The Department of Nutrition and Food Studies at NYU. 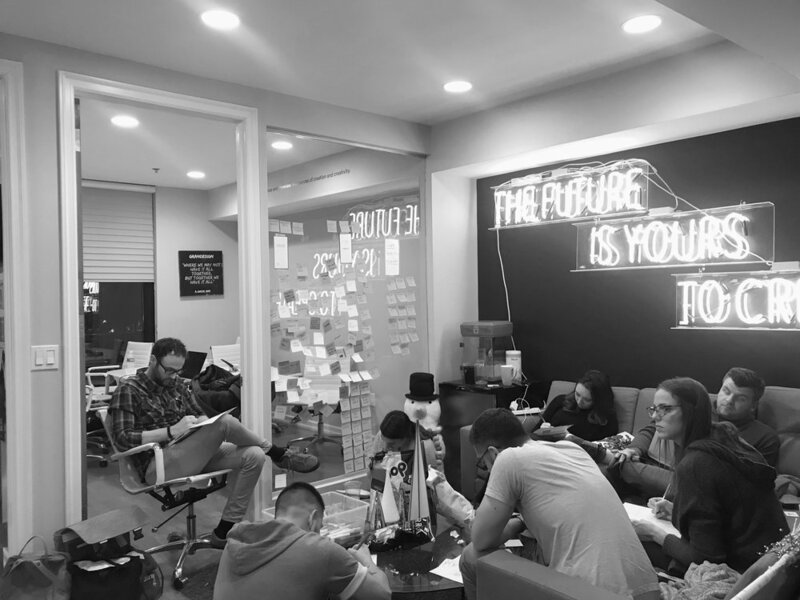 Role: Design Strategist, Researcher, Facilitator, and Designer. — David Maggs and John Robinson, Recalibrating the Anthropocene. My project partner and I co-started this initiative when we noticed the lack of sustainability efforts engaging civilians in their everyday life. Curious about the gap between high-level sustainability strategies and civil society, we decided to build a research and development project that focused on the disconnect between these two. In particular, we looked at the experience of climate change in our everyday lives and at how we could drive a sustainable transition that would take into account not just the scientific rational knowledge of climate change and the anthropocene, but also the emotional and practical challenges of facing climate change and evolving sustainable lifestyles. To do so we delved into an extensive interdisciplinary research analysis that combined techniques from applied phenomenology, organizational change, sociology, sustainability strategies, and design-led research. Ultimately, our research revealed that engaging individuals with food practices had the most potential for impactful individual agency. For food choices represent both the influence of our personal and global health, and as such are uniquely positioned as the bridge that can address individual and collective impact. Imbalanced diets, such as diets low in fruits and vegetables, and high in red and processed meat, for example, are responsible for the greatest health burden globally. At the same time the food system is also responsible for more than a quarter of all greenhouse gas emissions. Food at the individual level, however, is a representation of colliding worlds. An area in our lives that represents often contradicting values, with food choices being more frequently dictated by values related to present concerns (e.g. family, price, time, and taste) versus more future-oriented and removed values (e.g. sustainability and animal welfare). Furthermore, contradicting nutritional and health perspectives result in a high degree of uncertainty and concern for individuals when making food choices. At the same time, the emotional pressure of “living sustainably” creates an overwhelming ask for individuals to completely change everything they have come to know as their way of living, in order to be sustainable. This, combined with the belief that there is nothing or that there is too much to change and be done about climate change, creates a collective cycle of entrapment and inaction. My role in this project extended from its very beginnings of problem framing and defining to the design and implementation of research and project outcomes. The following five areas explain in more detail the extent of my role. 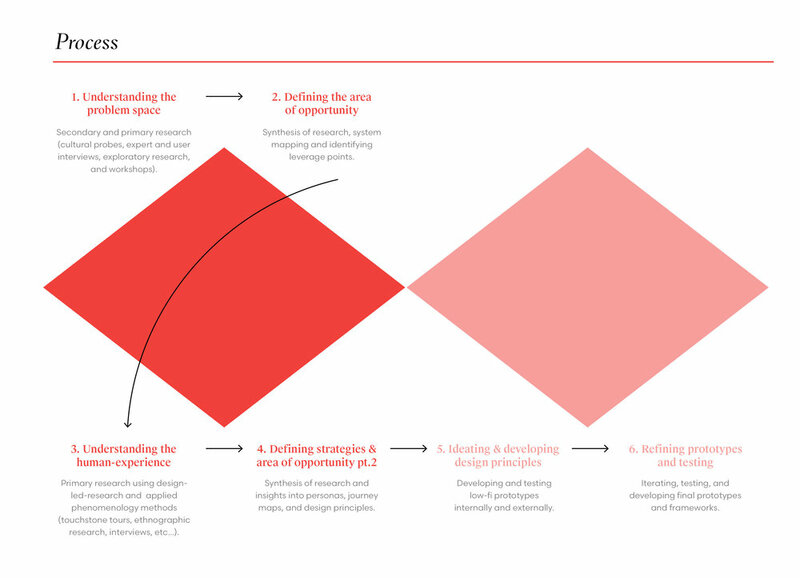 Interdisciplinary Research - problem framing, designing and planning research scope and focus, implementing primary and secondary research, and synthesizing research learnings. Leadership & Facilitation - managing the development of the project, establishing links with stakeholders, facilitating workshops, managing team dynamics, and communicating project findings. Sustainability Strategies - leading the use of sustainability perspectives, practices, and strategies throughout both research and implementation. Development of Final Outcome - translating insights and research findings into design principles and criteria which in turn I used to design and develop prototypes and final project outcomes. 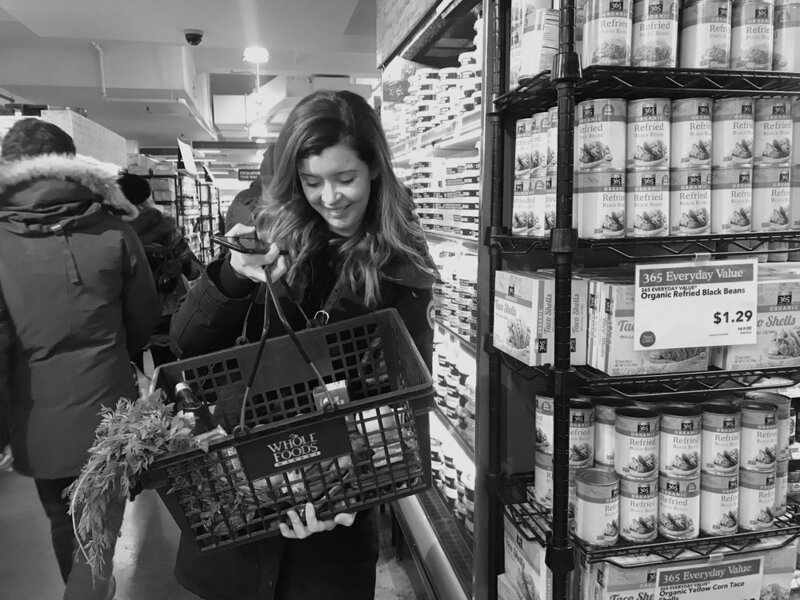 A dining experience, an omni-channel platform, and a new approach to transformational change for civilians transitioning to sustainable practices. In order to cultivate effective civilian engagement for sustainable transitions it is necessary to understand the individual and collective experience and perception of sustainability in the everyday. In large part, the outcome of this project is to make a claim for the need of, not only understanding human worlds and everyday experiences when creating high-level strategies for sustainability, but also for the need of designing tangible outcomes that address such needs. Cultural and social spaces for conversation and reflection, for example, become crucial pieces in establishing a large scale transition. However, reflection alone is not enough, and must be accompanied by practical tools that help transition society from new shared perceptions to collective action. There are three main outcome threads that run through the project. The threads are geared towards creating transformational change for addressing food sustainability at both the strategic high-level and individual level. To address the latter, the project resulted in the creation of a dining experience and an omni-channel platform. To address the former, the project puts forward a new theoretical approach for those who engage in high level techno-economic strategies and solutions. 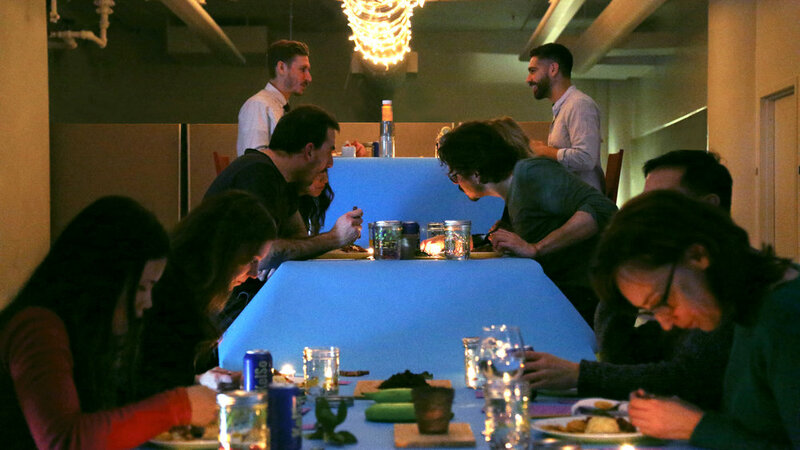 Dining experience - The dinner experience is a monthly dinner series that uses embodied learning and staged performances in order to create new spaces for conversations around sustainability and food practices. 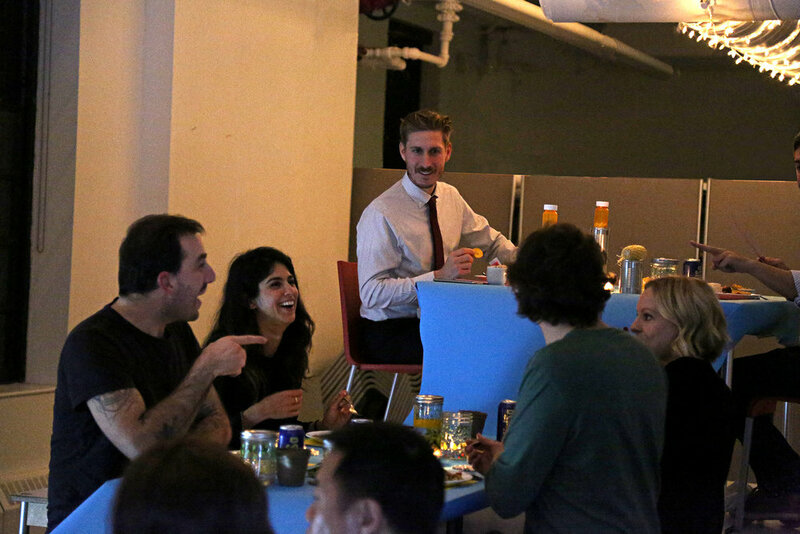 Introduced to guests as a desirable cultural experience akin to Sleep No More, the dinner uses elements of mystique and defamiliarization to present guests with staged rules of engagement, reimagined tools, meals, and calls to action for reflection. 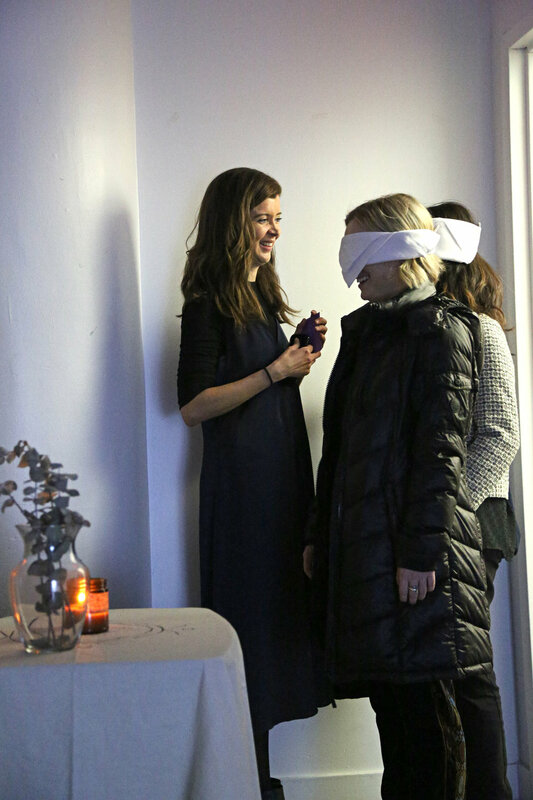 Ultimately, the experience created a safe space for conversation which in turn fostered the start of a new community, allowing guests to connect with each other, and delve into deep conversations around previously “taboo” subjects. Omni-channel platform - In order to extend the dinner experience into a practical tool, we design a mobile platform and website called ‘At Our Table’. 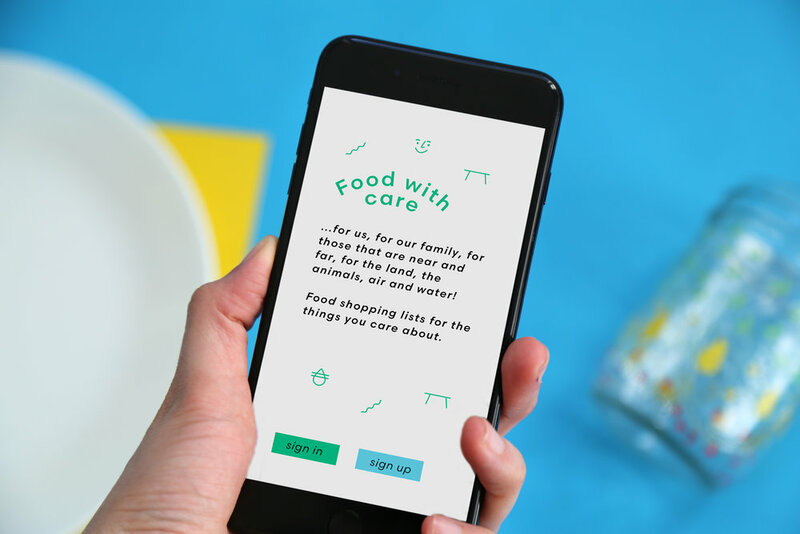 The platform uses a shopping list tool as a loose framework for alleviating anxiety around food choices. 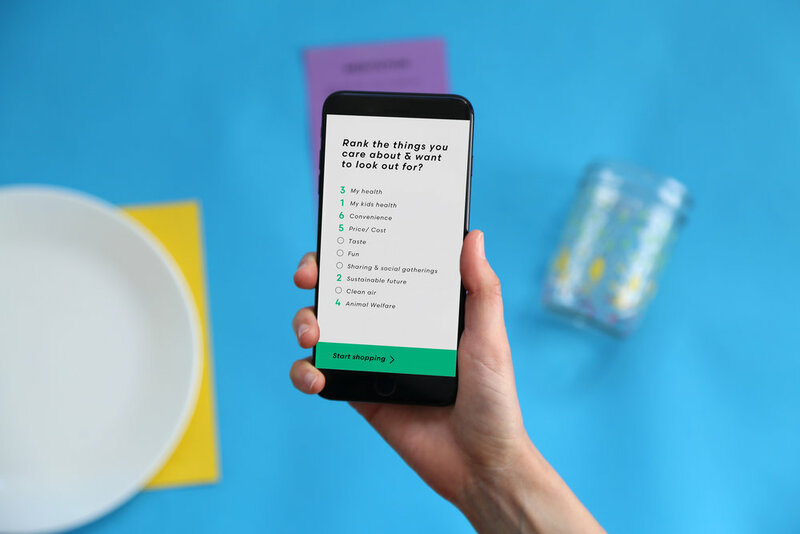 It does this by allowing users’ to rank issues they care about, for example: health, convenience, cost, environment, taste, etc… The user makes their shopping list on the app and when food items that are entered conflict with their values, they are highlighted using stoplight colors. The app then gives alternatives for the highlighted food item. Over time, the app would begin to link what people care about in the present to sustainable concerns. Additionally, the app allows for users to join a team, fostering peer-to-peer connections and communities that provide support through the transitional lifestyle changes. New theoretical approach - the project’s research findings have resulted in a new approach for engaging with civilians for climate change and sustainable transition strategies. In short, when civilians are asked to transition to sustainable lifestyles they face deep emotional challenges that shatter their understanding of what makes up their world. An understanding of this experience and the inclusion of civilian emotional and practical challenges into high-level strategy is therefore necessary and crucial. Currently, my partner and I are in the process of turning our research into a framework that discusses said challenges and lists implementable recommendations for organizations.